10ch board (bare pcb only) to allow a maximum of 10 LM399 voltage references to be monitored independently. This product consists of an unpopulated PCB only (no electronic parts). The photos below may show parts fitted, but this is only to show what it looks like when assembled using your own purchased parts. This is a 10ch board allowing you to plug in a maximum of 10 LM399/LM399AH voltage references and monitor them independently. It is to be used to age/burn-in up to 10off LM399 references in one go prior to installing them in your own target system. It's also very easy to monitor the reference voltage generated if you are looking to select from a batch a particular reference voltage range. Each channel has a 4-way socket with the same footprint of the LM399's so no soldering is required when plugging in your references. PCB thickness = 2.0mm, i.e. not the usual 1.6mm for a double sided board. This is in order to increase mechanical stability. Copper thickness = 2oz, i.e. double the normal 1oz. A BOM (bill of materials) is provided to give you an idea to what parts you can fit. The reason for this is that if you want super stability and don't mind paying for it then you can fit premium parts such as a chopper op-amps and 2ppm/degC resistors. On the other hand you can fit cheaper less stable parts. It's up to you! A schematic & component layout drawing is provided along with the bare PCB. Direct monitoring of the LM399 zener voltage can be done via test pads on the PCB, as well as the multiplied output (approx. 10vdc). Each channel has it's own supply voltage isolation link. 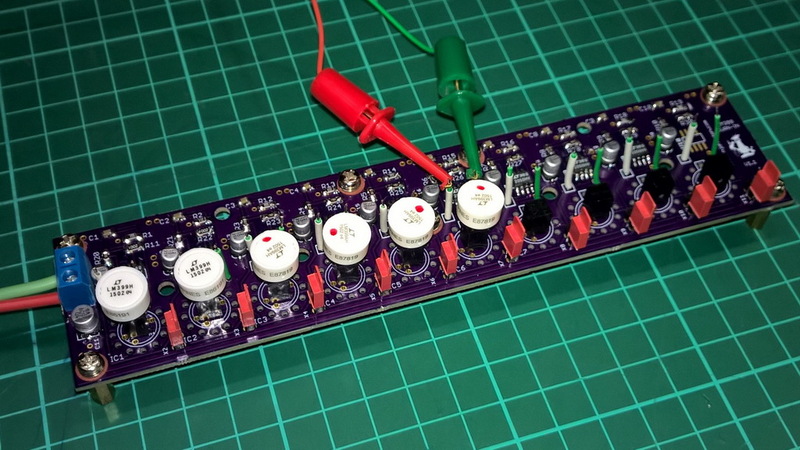 The 2-way terminal at the end is the 11vdc supply for the whole board (subject to the op-amps you use). Zip file containing the BOM (parts list), topside layout and the schematic here. Testing of my first prototype build, I only assembled up the first two channels. A VAT invoice (paid) will be supplied with every order.